Categories: Chhatrapati Shivaji, Pandharpur, Panduranga, Panduranga Bhaktas. Mother India has given birth to various mahans (saints) who loved God for love alone. 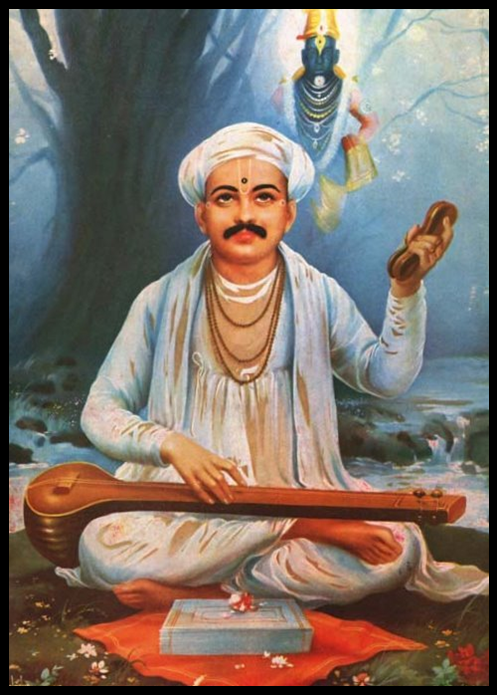 Sant Tukaram was one such supreme devotee who was deeply engrossed in his devotion for Lord Panduranga (Lord Krishna in Pandharpur, Maharashtra). 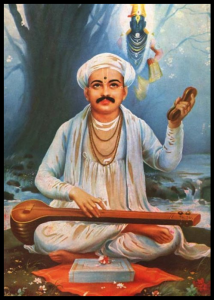 Tukaram’s love for God was so deep that his heart would melt at the sight of anyone wearing gopi chandan or tulsi mala or chanting the names of the Lord. He was so submissive that he would bow to all and saw all actions as God’s will. He was an epitome of humility, patience and compassion. If a devotee came to his grocery store chanting Hari Nama, he would consider himself to be most fortunate and would give away grains and spices for free. One day Chhatrapati Shivaji, the great Maratha king, was returning home with his army after a battle, and passed by Dehu, the village where Sant Tukaram lived. He remembered that his Guru, Sri Samartha Ramadas had mentioned about the great Sant Tukaram who lived there. He enquired and approached the saint with due respect. Tukaram was seated in the front porch of his small hut. His clothes seemed unclean and he was playing his Tambura singing to himself. But his face was bright and filled with tejas. He smiled at the king and signed him to come closer. “Please eat something,” he said. Even a single person would feel heartbroken to eat in Tukaram’s house looking at their poor living conditions. Shivaji had a whole army. He did not want to trouble Tukaram, so he hesitated. But Tukaram asked him bring all his men. When they came, he gave a pinch of wheat flour to everyone. After consuming that, the king, his soldiers, ministers and even the horses and elephants, felt so satiated that they felt they could not eat for the next ten days! Shivaji was amazed by this incident and realized Tukaram’s greatness. After a week Shivaji came back to Tukaram’s house with a huge offering of money and gold for his family. Tukaram reacted like one who had seen a ghost. He asked Shivaji to take away all the gifts he had brought. Shivaji insisted that he keep them, as his family was suffering in poverty. Tukaram looked at him and said “Does not the Lord, whose praise I’ve been singing for eternity, know the condition I am in? Would he not have given me this entirely if He desired so? Will money or gold bring peace? I am scared of this money… please take it away!” he said. But Shivaji insisted that Tukaram keep the money as he had brought it as an offering and that his acceptance would make him (Shivaji) happy. Shivaji understood his determination towards God and the level of dispassion Sant Tukaram had towards material things. For devotees who live only for God, material matters are abhorrent as they take them away from the One they love! 2 Responses to "Contempt for Money!" I was pleased to read this well written story for two reasons. Firstly my compliments to you for beautifully rewriting a story for the American population. The language and presentation are very good. Please do keep writing. My second reason is for including the sentence `Tukaram firmly replied, “Can I eat beef to make you happy? ..’ You beautifully touched upon a problem which many in America are encountering. I do not believe that Sant Tukaram would have even dreamed of uttering that sentence. But, you skillfully included that idea. I commend you for that. Please keep doing that. Hari Aum! Thank you for your kind words. The article was based on Sri Swamiji’s Audio CD on Sant Tukkaram. The articles usually go through many hands (editors) for refinement. Truly there is nothing I can take credit for. My humble pranams to our Sadguru’s Lotus feet! JG!